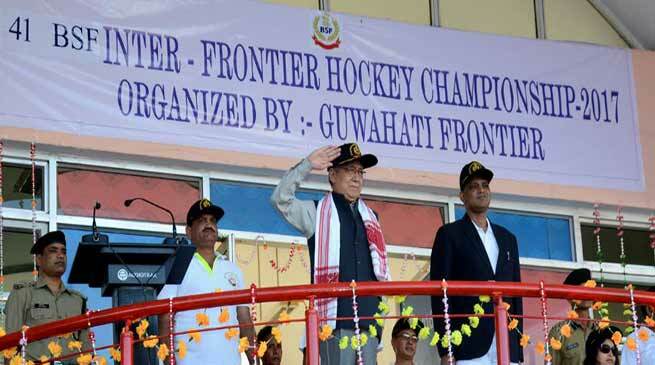 The 41st BSF Inter Frontier Hockey Tournament of BSF is being organised from 13-16 Nov 2017 at Moulana Md Tayabullah Hockey stadium, Guwahati, was declared open in a colourful ceremony. 12 teams participating from each BSF Frontier in the tournament will fight for the championship. BSF organises this tournament every year which provides an excellent platform for the teams to match their skills against other players. This tournament plays a significant role in raising sporting profile of BSF hockey teams and selection of budding players for BSF central hockey team. The Chief Guest of the opening ceremony R S Mooshahary, Former Governor Meghalaya said that such big events speak for the commitment that BSF hold for the sport. Welcoming the participating teams from all BSF Frontiers, he was hopeful to witness athletic performances of the highest quality over the course of this championship. He wished everyone to do his best and compete in the spirit of sportsmanship and fair play; and take the opportunity to come closer to each other. He encouraged all to make the most of this wonderful opportunity to showcase best hockey talent and spirit of comradeship. Border Security Force, the “First Line of Defence” securing Indo-Pak and Indo- Bangladesh border since 1965 has proven its mettle in Border Management. The spirit of sincerity and devotion to duty which has been imbibed in Seema Prahari’s is displayed and executed in all fields. Sports activity is a very prominent one in this respect. Several BSF players have formed the back bone of the National Football and Hockey teams which had participated in Commonwealth Games, Asian Games as well as in Olympics. 17 sportsmen of various disciplines belonging to BSF have also been honoured with ARJUNA AWARDS. Besides this, Sh Ajitpal Singh, former captain of the Indian Hockey team which had won the 1975 World Cup at Kualalampur and Sh Loveraj Singh, a renowned mountaineer, who had scaled the Mount Everest 05 times have also been honoured with PADMA SHRI AWARDS. BSF has a fine tuned system to identify potential talents, who are mentored nurtured by utilizing the resources of the Force. These talents are given employment in BSF where they are afforded opportunity to showcase their talent. The BSF Hockey team has always performed exceedingly well in the All India Police Games. Frontier declared the meet open, in the presence of distinguished guests and BSF personnel of Guwahati and all Frontier HQrs of BSF. This meet will conclude on 16 th Nov 2017.